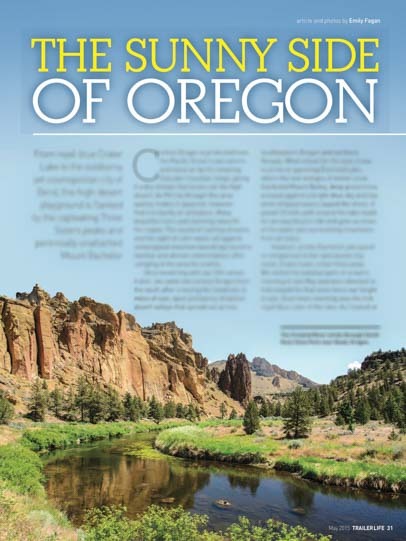 Trailer Life Magazine Feature - The Sunny Side of Oregon! I had read the Oregon article when we first received our May issue of Trailer Life, but had no idea that you had written it. So, after seeing this post, I looked all through that issue for a credit to you and Mark as writers of the article, but failed to find anything except your name under “Contributors.” And that doesn’t credit you with any specific article or say what the “contribution” entailed. Is this typical for magazines or is it just Trailer Life? If so, it is very different from the professional journals that I have submitted articles to where credit is of significant importance to the authors (particularly to academic authors). In the top right corner of the first page of the article (p. 31), there is a credit to me as the writer and photographer. This should actually be a credit to me as the writer and both of us as the photographers, since two of the photos were taken by Mark, but I forgot to indicate that on my submission and didn’t notice it during the editorial process. Each magazine handles credits, bylines and author bios differently, as well as everything else in the submission and publication process. We are pretty laid back about these things and approach it all as a team. Mark’s name got left off this time, but a few months ago he was given credit for a cover photo that was actually mine. No big deal. The fun is in the writing and the photography itself, and we are very proud that our work is purchased by these magazines, regardless of how we are credited. Thanks, found it. Probably should get new glasses!